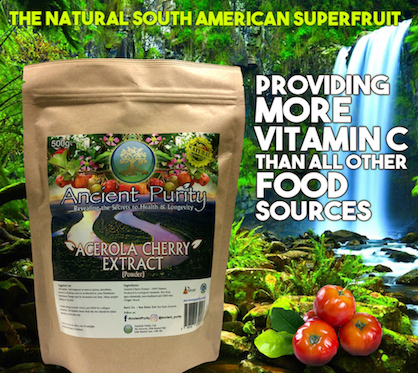 South American Superfruit Acerola Cherry Extract is incredibly rich in all natural Vitamin C, dwarfing the contents of Vitamin C in other fruit and vegetables. It's a delicious fruit additon to a super smoothie or desert. Acerola Cherries provide more vitamin C than all other food sources, according to the U.S. Department of Agriculture. Acerola juice is such a rich source that Medline Plus warns against drinking the juice if you also take vitamin C supplements. Whether you know them as acerola cherries or by one of their other names, such as Barbados cherry and West Indian Cherry, chances are you’ll only find them as supplements or in juices because the fresh fruit is highly perishable. Evergreen Acerola trees thrive in the warm climates of South America, Central America, California, Texas and Florida. Fruits from the tree mature to a diameter of 0.5 to 1 inch and develop into bright red cherries. The cherries deteriorate rapidly after they’re picked, with unappealing changes noticeable within 4 hours after they're harvested. They ferment quickly and become unusable within 3 to 5 days. When frozen, they tend to fall apart as they thaw, so they’re best used in jams, syrups and juices. Although super-rich in Vitamins C and A, This Acerola Cherry Extract is also loaded with other life-giving nutrients, essential for maintaining the normal functionality of our body. These include B-Vitamins (B1 or thiamine, B2 or riboflavin, B3 or niacin, B5 of pantothenic acid, B9 or folic acid, etc.) 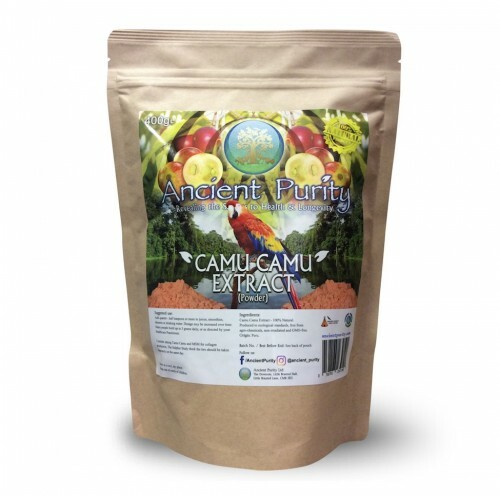 minerals and electrolytes (iron, magnesium, potassium, calcium, zinc, copper, phosphorus, etc. ), malic acid, sugars (sucrose, fructose, dextrose, etc. ), dietary fibre, protein, lipids, fatty acids, and so on. There are so many compounds that make Acerola Cherry a Superfruit... It's also packed with Folate, Copper, Vitamin A, and Potassium. But the biggest thing in it is Vitamin C, Vitamin C helps fight infections, strengthen the immune system, prevent blood clots, regenerate damaged skin tissues, build collagen and reduce the risk of poor health. Acerola fruit is a traditional remedy for scurvy, a disease caused by vitamin C deficiency. According to the University of Maryland Medical Center, vitamin-C rich diets help to reduce your risk of major health problems. 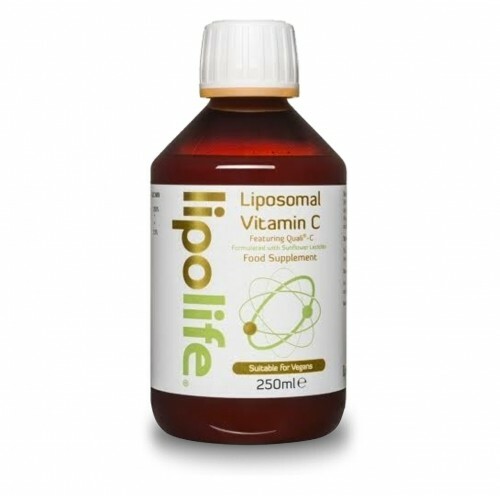 Such plentiful concentrations of vitamin C make it an excellent preventative for heart issues. Acerola regulates cholesterol levels, protects against atherosclerosis (hardening of the arteries) and stops blood clots from forming. The anthocyanins in acerola (responsible for the fruit’s red hue) also help treat the common cold, gum infections, sore throat and hay fever. 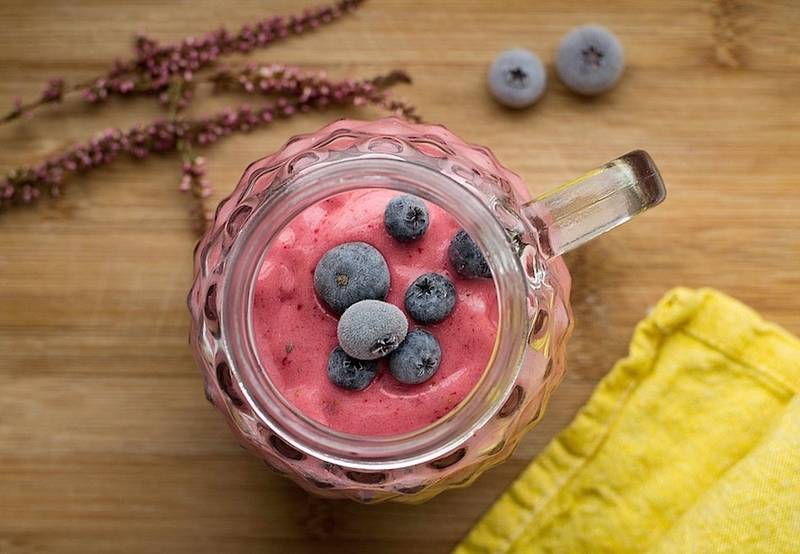 Anthocyanins have anti-inflammatory properties and can relieve headaches and fever. Highly absorbable form of vitamin C because it contains bioflavonoids, which help the body more readily assimilate antioxidants. 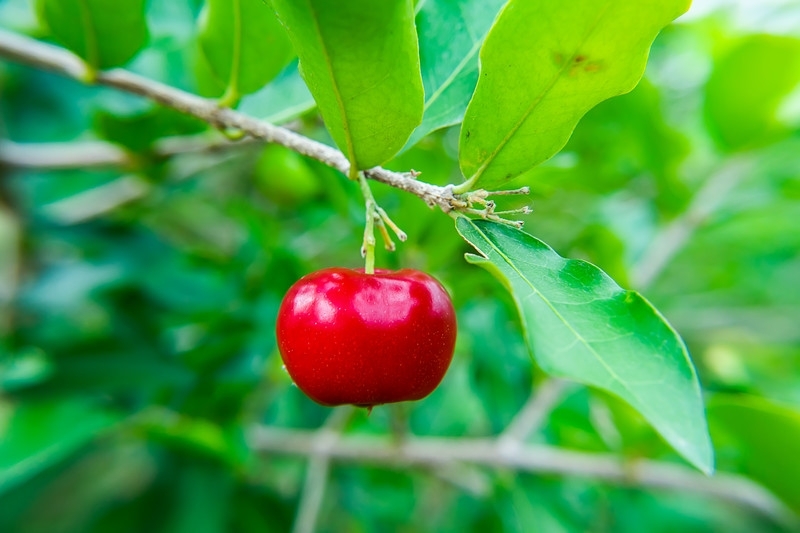 Acerola Cherry benefits may improve metabolism, normalise blood pressure and heart rhythm. Its folate content helps to regenerate new cells, and the copper it contains aids in iron absorption. The dietary fibre in Acerola Cherry helps clear waste from the intestines, thereby soothing constipation, diarrhoea, and many kidney and liver conditions. Acerola cherry benefits can even activate anti-stress hormones, making the fruit a useful treat when depressed or anxious. Acerola Cherry benefits can even aid weight loss. Not only is it low in calories, fat, and sodium, it’s high in nutrition. In addition, it speeds your metabolism and regulates cholesterol and blood sugar levels; it helps reduce your risk of obesity and supports your weight loss goals. 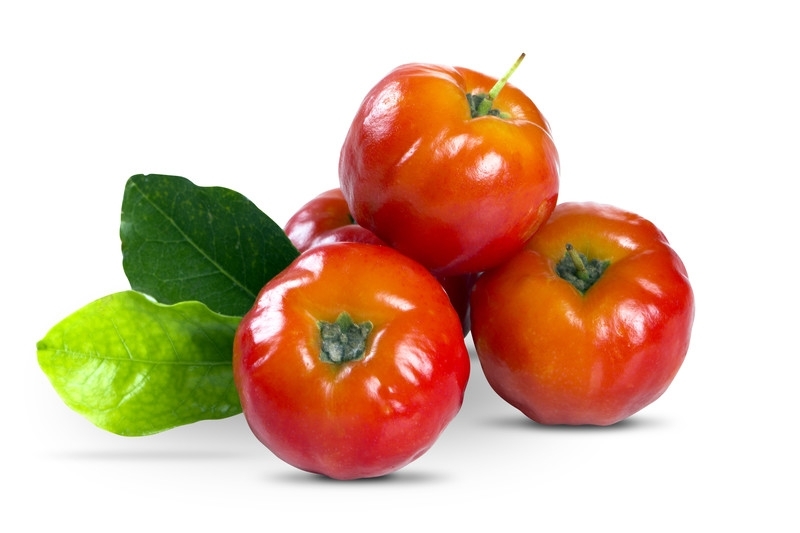 Acerola Cherry has also been praised for its anti-viral and astringent properties. 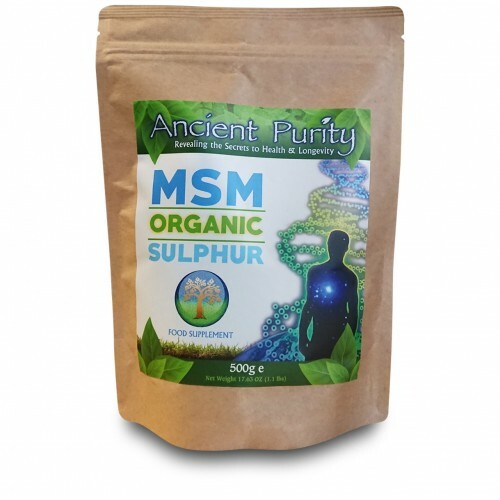 It is used in cosmetic products to help fight ageing, wrinkles, hyper-pigmentation and acne. A 1-cup serving of raw acerola cherries has 31 fat-free calories, 7.5 grams of total carbohydrates and 1 gram of fibre. 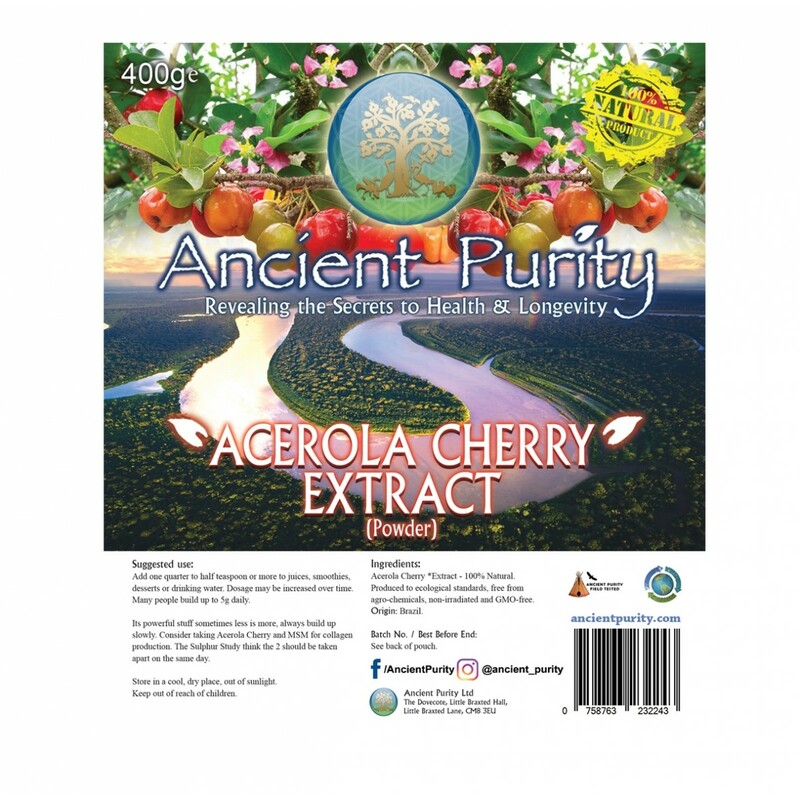 The U.S. Department of Agriculture does not report the sugar content of raw acerola cherries. However, a 1-cup serving of raw acerola juice contains 11 grams of sugar, so almost all of the juice’s 12 grams of total carbs come from natural sugars. One cup of the juice has 56 calories and retains almost 1 gram of fibre. The content of a small Acerola Cherry is equal to that of a full-sized carrot! 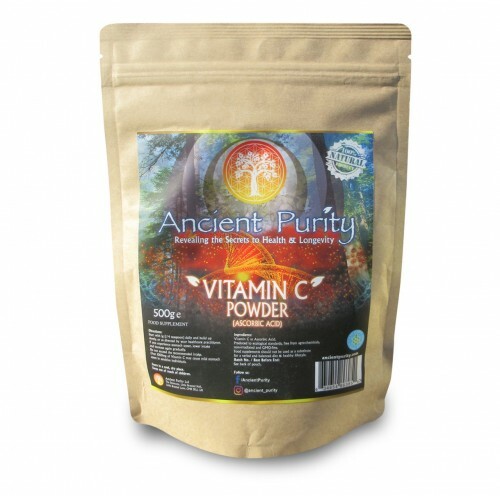 So you can easily fulfil your daily needs of Vitamin A by eating 1 or 2 Acerola Cherries a day or in this case supercharged because it's an extract. So it's a natural Vitamin A supplement too. Studies have found that the Vitamin C content of Acerola Cherry can produce sufficient collagen in our body, which means Longevity boosting and essential recovery for those who work out and/or have an active lifestyle. 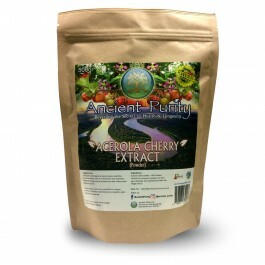 The few studies have been conducted so far on acerola cherry have provided some impressive findings. One study published in 2011 in Plant Foods for Human Nutrition proved that the acerola fruit protects against oxidative stress, which causes premature ageing and health problems. The Journal of Nutritional Science and Vitaminology published a study that found that Acerola Cherry Extract is an effective natural food. Adding Acerola Cherry benefits to your daily fruits and veggies may help boost your health. Acerola Cherry *Extract - 100% Natural. Add one quarter to half teaspoon or more to juices, smoothies, desserts or drinking water. Dosage may be increased over time. Many people build up to 5g daily. Its powerful stuff sometimes less is more, always build up slowly. Consider taking Acerola Cherry and MSM for collagen production. The Sulphur Study think the 2 should be taken apart on the same day.